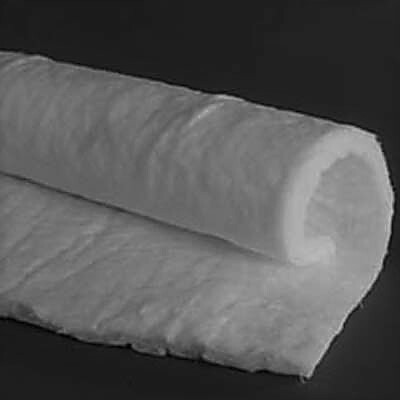 RS-SI Moldable | ZIRCAR Refractory Composites, Inc.
ZIRCAR Silica Moldable Type RS-SI Moldable is a wet blanket that is a combination of high purity amorphous silica fibers and inorganic silica binder. The fibers are 6-9 um in diameter and are considered non-respirable. Upon drying, Type RS-SI Moldable becomes a rigid structure with useful properties to temperatures of 1100°C (2012°F). Type RS-SI Moldable exhibits good wet handleability. It is easily cut with scissors or a knife and can be applied directly to equipment with complex contours. It can also be used to fabricate flat sheets or boards. Drying can be accomplished in an oven, with a hot air gun or torch, or by exposure to heat in the application. Drying results in a strong, rigid, low density shape that can be re-wet to restore the original moldability. Baking irreversibly removes the moldability, leaving Refractory Sheet Type RS-SI Moldable unaffected by moisture. Type RS-SI Moldable exhibits excellent resistance to attack by most chemicals with the exception of caustics. It will tolerate all acids except hydrofluoric acid. It is not wet by molten aluminum . RS-SI Moldable is 100% organic free and contains no refractory ceramic fiber. It is readily machined to precision tolerances with conventional tooling. Insulation Wrap for High Temperature Process Piping. Fabrication into Rigid Silica Fiber Boards and Cylinders. Useful where Refractory Ceramic Fibers Are Not Desired.